Spiritual Kung fu is a show for helping you win your inner-battles and bring light to the darkness in our world. 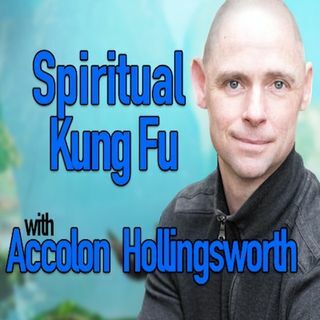 Accolon shares skills, methods and insights from Spiritual Kung fu which is the self-mastery system he developed from his Kung fu Priest training and almost 30 years of study and experience. You will learn skills for defending your well-being and becoming a master. Listen in for deep health, soul strengthening and transcendent transformation. Accolon was trained as a Kung fu Priest ... See More and is dedicated to strengthening humanity. 12 years after beginning his kung fu training, he graduated his apprenticeship and became a full-fledged teacher. Accolon then spent 13 years developing the foundation he was taught into Spiritual Kung fu: his system of self-mastery. His life’s work is bringing light to the darkness by contributing Spiritual Kung fu to as many people’s lives as he can (to help them win their inner-battles and make our world more enjoyable).